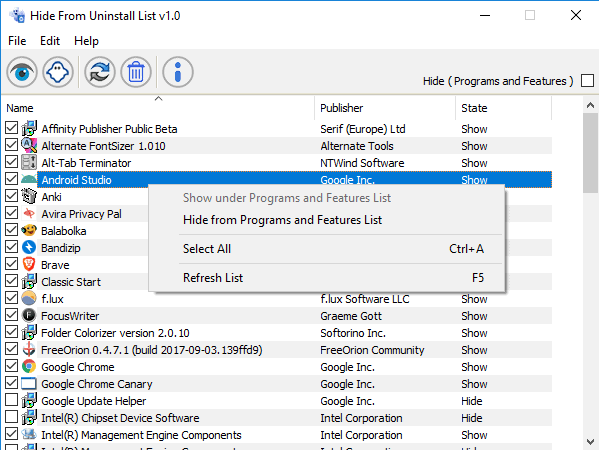 Windows users who want to hide certain programs from the uninstall interfaces of the operating system can use the freeware Hide from Uninstall List to do so. The free program includes options to hide individual programs or all of the programs from uninstall lists the operating system provides. Hide from Uninstall List is a free portable program for Windows that users can start right after download and extraction of the archive the program is distributed in. The program is compatible with all versions of Microsoft's Windows operating system starting with Windows XP and comes with several interface languages that users can switch between from within the program window. The application displays the list of installed programs and apps in the interface on start. Select File > Languages to switch to another interface language if you don't want the program to use the system language but another of the supported languages. Each program is listed with its name, publisher and current state. State indicates whether the program is listed under "programs and features" in the Control Panel and the Apps listing on Windows 10 devices. Right-click on any program and select "Hide from Programs and Features List" to hide it in those interfaces. Mark multiple entries at once to run the state changing operation on all of them at once. Note: While the program is no longer listed in the Control Panel or Apps listing in Settings, it is still listed in other locations such as on the hard drive or in the Start Menu. The main idea behind Hide from Uninstall List is to prevent the removal of the program on the system using default system tools. The only other option provided is to hide programs and features. This removes Apps & Features from the Settings app on Windows 10 and empties the entire Programs and Features listing of the Control Panel. Changes that you make are applied instantly. A click on the Programs and Features link in the program interface opens the Control Panel applet for verification. Experienced users may wonder why someone would want to use a program like Hide from Uninstall List. It is clear that it is not used to fully protect a program from being uninstalled as there are multiple ways to remove programs other than using the Apps listing or the Programs and Features listing. I think it is designed for users who share the PC with others or are supervised. It provides some level of protection from detection and removal. While that is not perfect, it may do for some users. Hide from Uninstall List is a program that some users may like. The majority of Windows users may not see much of a use for a program of its kind though probably. Now You: What is your take on the program? That is my take on the program. Thanks for the article, Martin. Interesting. It would be helpful if it could also remove Uninstall entries from the Start Menu. Many programs have the habit of putting uninstall items/direct links there and it’s all too easy to click them. I manually delete them every now and then but they will reappear on every program update. I don’t understand how this is useful to anyone. If you want to prevent users from uninstalling stuff, wouldn’t it be better to use the existing Windows permissions system to prevent anyone who isn’t an admin from installing and uninstalling software? I like it. The Apps list in Settings is HUGE. With this I can hide the programs I know I’ll always need, making it easier to scan for ones I to uninstall. Very useful for me when i fix my friends computers. They know nothing about computers…. Many times they uninstall stuff that i need when i work with their computers and sometimes they even uninstall other stuff….LOL !